For much of the season, Josh Adams seemed to have been flying under the radar. Not many running backs can have a 200 yard rushing performance and average over nine yards per carry without being noticed by the national media, especially when playing for one of the biggest programs in the nation, but Adams did just that. The knock on him was that he wasn’t able to put in a major performance against better opposition under the lights. In both prime time games against Georgia and Michigan State, Adams was held to 53 and 56 yards respectively and didn’t have as great of an impact in the outcome in those games. Against Georgia, their fearsome front seven gave the Notre Dame offensive line fits and totally shut down the offense, limiting Adams’ production to 2.8 yards per carry. Against Michigan State, Adams was much more effective carrying the ball for 6.2 yards per attempt, but nagging injuries forced him out of the game in the first half. It’s those same nagging injuries that have limited Adams’ carries in other games to a high of 19 and has forced the staff to rest him early in blowout wins in order to keep him healthy. Against USC, Adams’ star shone brightest. Adams was efficient with his runs, allowing the offensive line to do its work against a banged up USC defense as he picked them apart with his decisive running. Then, in prototypical Notre Dame fashion this season, they kept running the ball until finally in the third quarter an alley opened up in the middle of the defense which saw Adams burn yet another team with an 84 yard run to the end zone, his longest of the season. It was that run which put the nail in the coffin for USC and put away any hopes of a comeback in their psyche. Adams finished for 191 yards on 19 carries for a 10.1 yards per attempt average and three touchdowns. Adams once again failed to cross the 20 carry mark, but this time due to the outcome of the game being such a forgone conclusion instead of injuries. With this performance, Adams has definitively vaulted himself among the top handful of running backs and has at the very least put himself in the Heisman conversation. This defense is continuing its steady climb back to prominence and their performance against USC is what led to such a massive lopsided win for the Irish. With the offense stalling early on their first possession of the game after receiving the opening kick, the defense wasted no time in making big plays. With their first offensive play, USC star quarterback Sam Darnold was strip-sacked which gave the Notre Dame offense the ball back on their 49-yard line. The turnover and short field position gave the offense the momentum to zip down the field in three plays for the Equanimeous St. Brown touchdown. The defense played stiff the entire first half, as a short 5-play drive gave Notre Dame the ball back to drive down for another score, this time to Kevin Stepherson who is on a quest for redemption. Notre Dame was then aided by special teams fumble off of a muffed punt return gave the Irish the ball on the USC 9-yard line which they ran in for another score. It looked as though Sam Darnold was going to drive his team down the field with a drive-opening pass for 17 yards, an interception to Nick Watkins on an errant throw on the ensuing play gave the offense the ball back with all the momentum in the world which they turned into 59 yards and another touchdown to go up 28-0. The defense allowed roughly 105 yards in the first half of play along with a pair of turnovers to go with a muffed punt. With the 21 points after turnovers, the Irish were able to put the game away in the first half of play against a rival ranked near the top 10 who many had as a playoff contender. What’s more is that the defense shut down Ronald Jones and the USC running game for 76 yards on 31 carries for a 2.5 yard average. The defense also cleaned up on third down allowing only 4 of 13 third down attempts for a 31% conversion rate. For all the injuries that USC has had, it wasn’t supposed to be this easy against a very dynamic and loaded offense but Mike Elko’s men got the job done. With this latest win in the books, Notre Dame has moved into college football’s elite teams and is currently ranked ninth in the country. It was difficult to gauge where Notre Dame stood in the first half of the season. 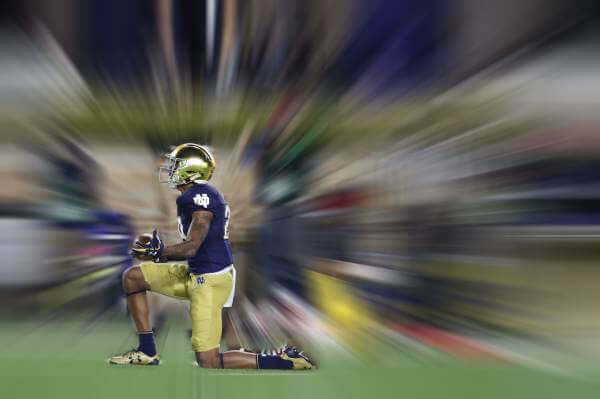 For a while, it looked like the same old Notre Dame that couldn’t get the job done against the nation’s best teams as it capitulated at the end of the Georgia game and failed to record a statement win. It went on to blow out the rest of the teams on its schedule, but there were lingering questions on how good that schedule was. Critics were looking toward this game against USC as Notre Dame’s opportunity to prove their doubters wrong and that is just what they’ve done. For all the issues that plague USC, they are still a highly ranked team that is loaded with star talent across multiple position groups. They were the 11th team in the country and were led by a Heisman candidate at quarterback whom many have as the best quarterback prospect in this year’s draft. Notre Dame didn’t just come out and win, they dominated USC in all three phases of the game with the national spotlight on them. Notre Dame looks more impressive each and every week with #3 Georgia only proving how elite they are, having only beat Notre Dame by one point, Michigan State continuing to roll through the rest of their schedule cementing themselves in the top 20 at #16, and even Boston College breaking through on offense and becoming a solid well-rounded team now at 4-4. I’ve been critical of Notre Dame in past years for playing down to their competition, but as I mentioned a few weeks ago, Notre Dame is rolling through their opponents and even crushing teams that are pretty good. This is what will elevate them to being considered among the elite with the Ohio States, Alabamas, and Georgias of college football. It gave me goosebumps during half-time when NBC ran their special on the “Green Jersey Game” from 1977. What gave me chills in particular was Joe Montana’s stat-line which included two passing touchdowns and two rushing touchdowns and realizing that Brandon Wimbush was only a rushing touchdown away from matching that mark. It was inevitable, but Wimbush got his second rushing touchdown and led the Irish to a similar result of 49-14 instead of 49-19. What’s also spooky, Notre Dame’s only loss during that 1977 national title season was a week 2 game against another SEC team in Ole Miss who they lost to 20-13 in a tight matchup at home. Can this Notre Dame team wake up the echoes and channel the ghost of the “Mean Green Machine?” Time will tell. Brian Kelly gave his game ball to Khalid Kareem. It’s also easy to give it to Te’Von Coney following the monster game he had and getting the USC beat down started with a strip sack of Sam Darnold as well as Josh Adams who cemented his place in the Heisman conversation. I’m going to go in a different direction. I’m going to give my game ball to Kevin Stepherson. Stepherson endured a rough offseason while being in Brian Kelly’s doghouse all year and then missed the first four games with what was reported to be a 4-game suspension which Brian Kelly would not publicly confirm. Stepherson nevertheless endured and made a statement in today’s game. Stepherson was dynamic and sharp whether it was his contribution to the running game or to help Brandon Wimbush open up the passing game. Stepherson finished with 58 yards on three catches for a touchdown and added another 24 yards on the ground on a pair of carries. Stepherson added another element to the offense, and if he could continue to give maximum effort both on and off the field, then he could help elevate this Notre Dame team to something special. What’s most important though is that Stepherson can serve as an example for others of what it means to buy into the system and to hold oneself to a higher standard.